Dead of Winter is an experience that can only be accomplished through the medium of tabletop games. It is a story-centric game about surviving through a harsh winter in an apocalyptic word. The survivors are all dealing with their own psychological imperatives but must still find a way to work together to fight off outside threats, resolve crises, find food and supplies, and keep the colony's morale up. 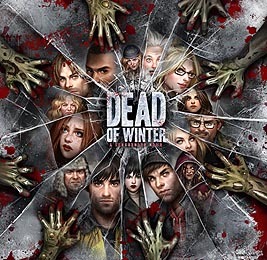 Dead of Winter has players making frequent, difficult, heavily thematic, wildly-varying decisions that often have them deciding between what is best for the colony and what is best for themselves. An absolutely astounding game. Just by opening the box and looking over the incredible components you can tell you are in for a treat. Initially I was put off by the standees for the zombies and characters but I have to admit the artwork is stunning. I would class the game as medium-weight, relatively easy rules with nothing too complicated. Game length can be adjusted by playing different scenarios which all vary in Difficulty and length, from experience the average game time has been a little over an hour. If you are not into zombies do not worry, they take a backseat to the player interaction. You have to deal with them occasionally but the real thing this game has to offer is the crossroads cards and hidden objectives. Crossroad cards add a very unique element to this game that I have not seen elsewhere. They are drawn every turn and only activate under certain circumstances (player location or doing something like scratching your head for example) Upon activating they force you and your group with tough choices to make which can have major consequences or rewards for your group. Hidden objective cards force players to work towards things like hoarding goods or avoiding danger, the colony can complete the main objective but you do not win with everyone else unless your hidden objective is also completed at the end of the game. There is also the ever looming threat of a possible traitor hiding in your group, waiting to tank the colony and win the game for themselves. I definitely recommend this game, if you have played games like Shadows over Camelot or Battlestar Galactica then I’d recommend that you take a look on the internet and watch a play through and see if it’s something that you may like.